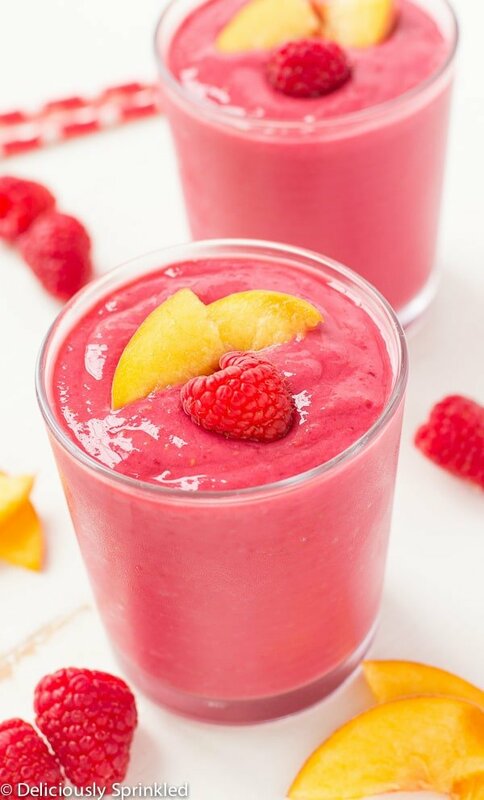 Raspberry Peach Smoothie– a delicious and simple smoothie filled with raspberries, peaches and vanilla greek yogurt. Hi, everyone! Jennifer back from Deliciously Sprinkled with one of my favorite smoothie recipes. I love smoothies, I make myself a smoothie almost everyday. 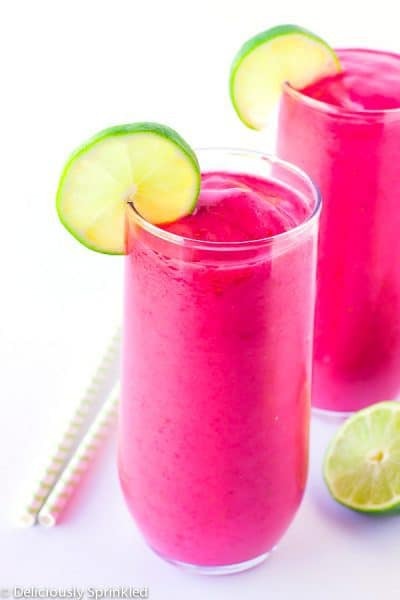 I switch between my go-to Breakfast Energy Smoothie, Energizing Green Smoothie and my new favorite which is this delicious Raspberry Peach Smoothie. 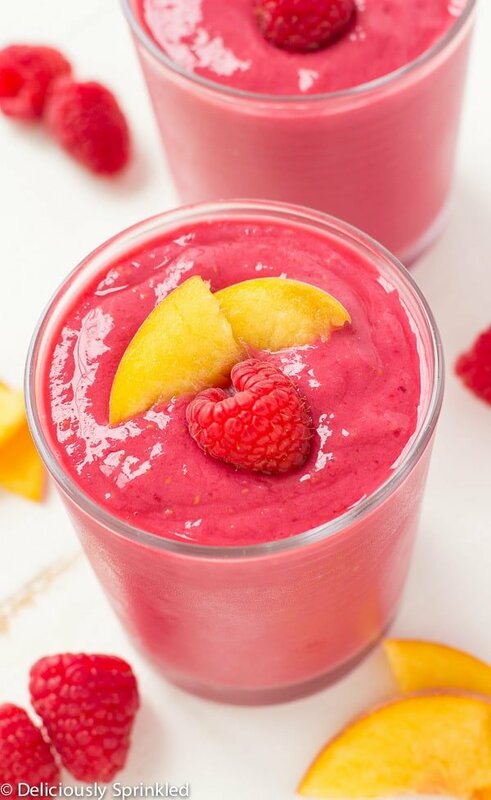 Making this Raspberry Peach Smoothie is super easy. All you need is some frozen raspberries, peaches, vanilla greek yogurt and vanilla almond milk. Blend it all together and you have a creamy, tasty smoothie to start your day! 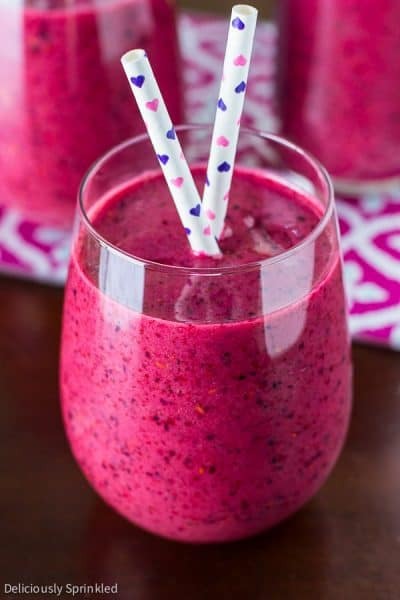 Place all ingredients in blender and blend until smooth, adding a bit more almond milk as needed if the smoothie is too thick. Serve and enjoy! Since I have cracked down on added sugar, I have been eating Greek yogurt with frozen raspberries and chia seeds. No sugar at all. I used to think the yogurt was too sour/strong without sweetening, but now I find that the fruit is enough sweetness. 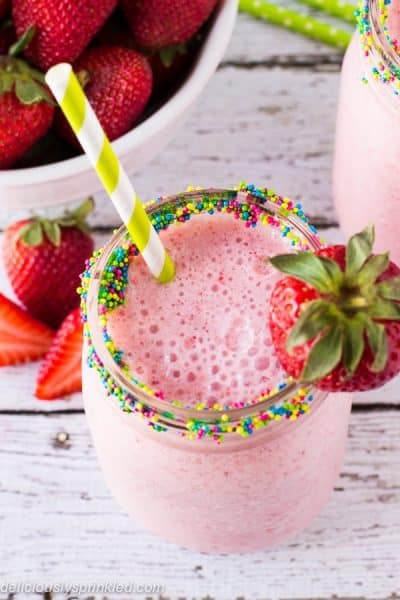 I love smoothies for breakfast! I always add a handful of fresh spinach leaves for the iron content. You can’t taste it, but the benefits are in there! Even my girls love it. This is simply a stunning recipe. I love this. Thanks for sharing.